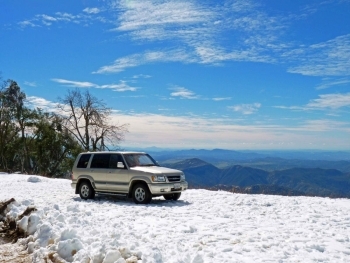 Palomar Mountain is located about an hour north of Escondido, or an hour and a half from San Diego. It’s accessible off Highway 76. We stopped off in Escondido and headed up Bear Valley Parkway toward 76, however you could also access this highway off I-15 to the west, or via Santa Ysabel in the mountains of East County. We drove up through orange and grapefruit groves, marveling that only in Southern California would you see ripe citrus against a backdrop of snow-capped mountains just minutes away. The meandering drive also took us stands of wild lilacs, horse ranches and a llama farm, fresh produce stands and an egg farm. Turning off 76 onto South Grade Road, it’s about a ten-mile climb to the 6,100 foot-high peak where Palomar Observatory is located. Roosevelt once said, “Keep your eyes on the stars and your feet on the ground.” Unfortunately, stargazing was not an option on this trip, since the observatory was closed due to the heavy snowfall. 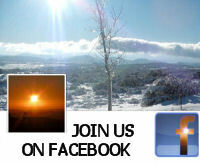 Fortunately, Palomar State Park was open. 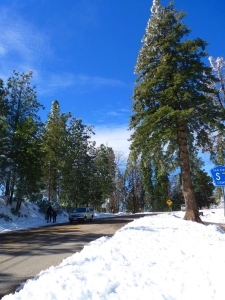 There was also plenty of snow even before you arrived at the park entrance, where an $8 fee per car is charged. 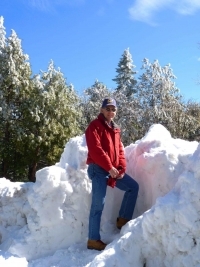 Outside a general store and gift store, a snow plough had cleared the lot and heaped up snow into an eight to ten foot-high pile -- much to the delight of children and the young at heart who enjoyed scampering up the embankment to the top. We paused at a scenic overlook not far outside the park, where some travelers had parked an SUV in pristine snow—looking like a car manufacturer’s picture-perfect ad. 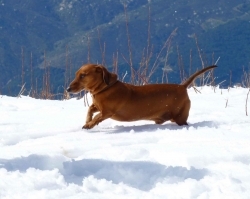 A family with children played in the snow—along with a dachshund frolicking in the frosty white fluff. 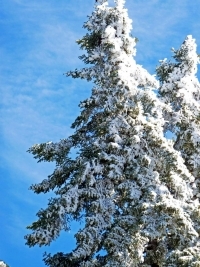 People were building snowmen, tossing snowballs, or glided over the snow in snowshoes or cross-country skis. 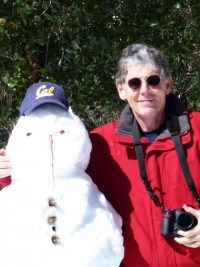 We paused to pose with a snowman, adding a Cal-Berkeley hat in honor of our son who had to work today. Go bears! 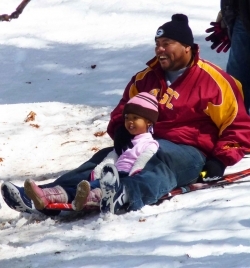 In many places, people enjoyed sledding downhill at locations both inside and outside of the park. Warning! Watch a few people sledding down any given spot to learn the lay of the slope before trying this on your own. We saw quite a few crash landings as sledders became so enthralled in the ride or waving to parents, kids or significant others that they forgot to watch where they were going. One hit a fence, another crashed into bystanders, and several skidded onto an asphalt walkway. 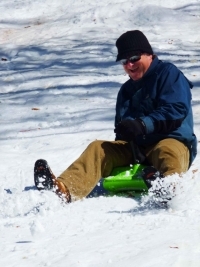 Heavier sledders became airborne over a hidden bump---leading one rider to complain of neck pain. Most had a great time, however, as children squealed gleefully and parents joined in the fun, too. Each sledder seemed to develop his or her own technique, some sliding down on their bellies, others sitting, still others lying down--and one daring youngster stood up to ride his sled downhill, snowboard-style. Just outside the park, we drove down a short road to Bailey House, a pioneer homestead built in 1888 and still operated by the Bailey family. 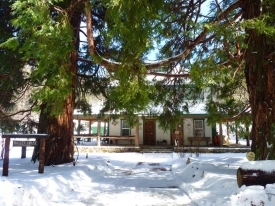 Today, the home is the centerpiece of Bailey's Palomar Resort, which also includes cabins and a campground. 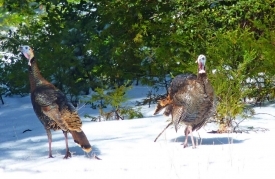 On the road toward Palomar Observatory, we spotted some special snowbirds: wild turkeys! Gobbles intermingled with the whooshing sound of melting snow falling off towering trees, thudding down onto the top of our car. (Don't try this drive in a convertible or with an open sun roof.) We also caught a glimpse of the bad-tailed pigeons that inspired the Spaniards to call this place Palomar, or “place of the pigeons,” though the land was occupied by Luiseno Indians long before the Spanish set foot on the mountain. Palomar State Park was established in the 1930s, and I hope that it will stay a park in perpetuity. President Theodore Roosevelt, a Republican, understood the value of conservation and of preserving our wild and beautiful lands for future generations. That’s a value worth contemplating on this Presidents’ Day. “Of all the questions which can come before this nation, short of the actual preservation of its existence in a great war,” Roosevelt concluded, “there is none which compares in importance with the great central task of leaving this land even a better land for our descendants than it is for us."